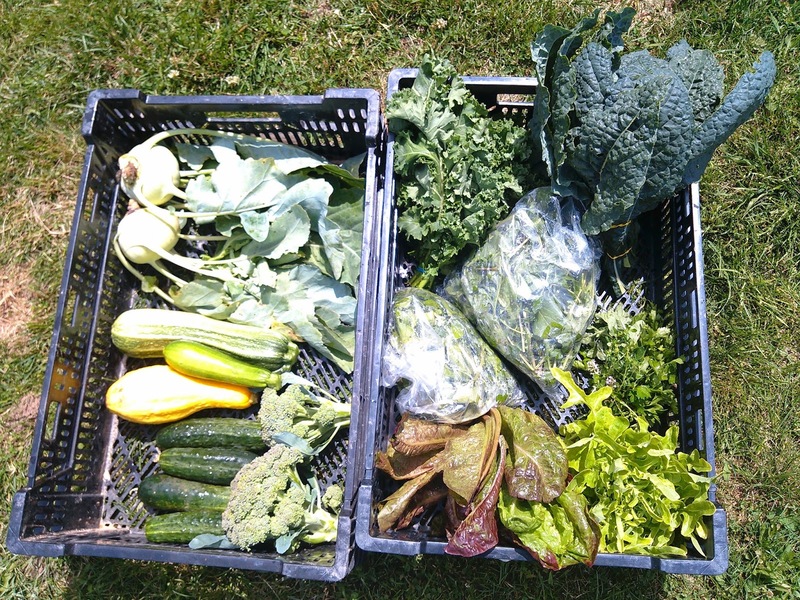 It's week four of this years CSA and things in the garden have been going well. As some of you may have heard it's been a rough couple weeks outside of the garden though. Farmer Don had a motorcycle accident, a deer jumped in front of the bike, and broke his leg. Now the farm truck, Roland, has broken down, and we're waiting to get the diagnosis from the auto shop. Not to be deterred, we are still planing on regular delivery of shares this Friday and on farm pick up on Saturday. New this week! Another summer favorite that is easy to use in a lot of different recipes. We will have a mix of Zucchini, heirloom costata romanesco zucchini and Yellow Crook Neck squash for everyone this week. These will be a little small for zucchini bread, but are great to add to any saute or stir fry. You can also grill them, bake them or if you're feeling a little crazy eat them raw. More Broccoli this week. This is one of our favorite veggies here on the farm, and very happy to see it included again in this weeks share. This veggie can be used so many ways it almost seems silly to try and give suggestions for use. You can eat it raw in a salad, cook it in a stir-fry, throw it in a soup, steam it and have it as a side to any meal. Let us know your favorite way to eat this super nutritious green! We have more cucumbers this week! This is a slicing variety called "Excelsior" specifically bred for greenhouse growing. Despite this fact, they seem to take a lot of water to grow. Farmer Figgins waters the greenhouse daily, and has noticed that some will have areas inside the fruit that the flesh hasn't developed fully in leaving small holes. This doesn't effect the edibility of the fruit but has lead Farmer Figgins to declare that we will be using a different variety next year. Kohlrabi may be a new vegetable for some of you, but we promise it's one you'll be glad to try! The word Kohlrabi is German for cabbage turnip, and it can be eaten raw or cooked. We usually eat them raw, just peel off the skin and slice them like an apple and sprinkle with a little salt or dip in your favorite dressing and enjoy! They're also great raw on a salad, or roasted, or baked. A few shareholders have tried frying it in butter with onions, and loved it that way. As one share holder said this week "you can make them a different way every time and every time it's like a different food that is delicious!" This is the last kohlrabi of this planting, but we'll be seeing more later this year! Half shares will be receiving one head of lettuce this week, Full Shares will be getting two. This week the heads ready are a mix of green oakleaf, bibb lettuce, and green romaine. These can form the heart of a great salad along with the other mix of veggies this week. We have several different varieties of lettuce growing on the farm so keep your eyes open for the different heads that will make their way to you throughout the year. We have put some extra planning into planting our lettuces this year so that we can extend the greens through more of the summer so everyone should have lots of opportunities to enjoy lettuce in their salads. Our Lettuce mix needed another week to regrow, but fear not, we'll be seeing more delicious lettuce mix again! This green became a favorite for a lot of us last year, Farmer Don certainly came to love it. There are many great ways to enjoy this super food, which is loaded with vitamins. You can of course eat it raw, or throw it in a juicer. We really enjoy throwing it in the cast iron with butter, salt, pepper, and some red pepper flakes, for a great side to any meal. It is also a great healthy snack when you bake them into Kale Chips. Arugula is a pungent, peppery flavored green originating from the Mediterranean. Spice up any salad, sandwich, or pizza with some Arugula! For a pizza topping you can add it just before baking or immediately after. Also eaten raw, coarsely chopped in pasta in Italy. With salad--try it with some mozzarella cheese, pine nuts and sun dried tomatoes! We've got bunches of Parsley, Oregano and Thyme this week, enjoy! Can't use it all? Here's a simple How-To on drying your own herbs.